Bowman, Veileux and Wilson earn recognition. 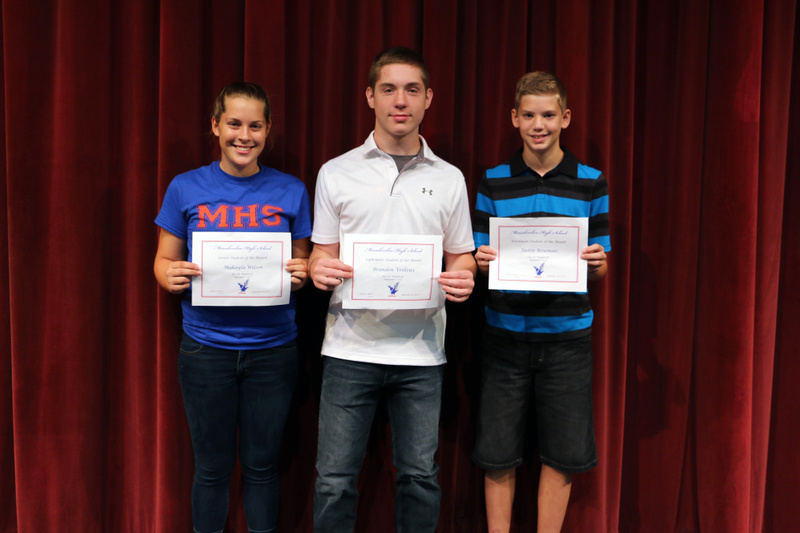 Messalonskee High School recently announced its September Students of the Month. Being an impactful student goes beyond excelling academically and has much to do with the attitude a student brings to school each day. The latest Students of the Month all bring positive energy and engaging personalities to the classroom, a quality that helps create a warm and inviting environment at Messalonskee High School, according to a news release from the school. Bowman is an excellent student who is constantly engaged in his studies and work. He asks insightful and thoughtful questions as he strives to truly understand concepts. He goes way above and beyond to participate in class. His enthusiasm and energy contributes positively to the classroom environment, according to the release. Veilleux follows a similar pattern. He is diligent with his work and is an active participant in class discussions as well as a student who is courteous and helpful to classmates, according to the release. As for Wilson, the senior winner, her trademark is the warm smile she brings to school on a daily basis. A member of Messalonskee’s Class A state championship basketball team, she is a talented athlete who also makes extra efforts to help her sister, who is a freshman at Messalonskee this fall. Wilson, in every way, serves as a role model for her peers, according to the release.